Arizona Republican Gov. Doug Ducey speaks to Arizona National Guard soldiers prior to deployment to the Mexico border at the Papago Park Military Reservation in Phoenix, April 9, 2018. Arizona is sending 225 National Guard troops to the U.S.-Mexico border and Governor Doug Ducey said more troops would be deployed Tuesday. "Border security is a top concern here. Two-thirds of our border already has a wall. If we want to fill in the other third with a wall, I would welcome that. I don't like how our border is wide open and unsecure, specifically in the Tucson [border city and county] sector. I also think we can use boots on the ground and technology," Ducey told reporters Monday. Arizona joins Texas, which sent 250 Guard troops to the border Friday. The other two border states, New Mexico and California, have not called up any guardsmen, although New Mexico's governor has indicated that the state will participate in the activation. California's governor has not said what his state will do. 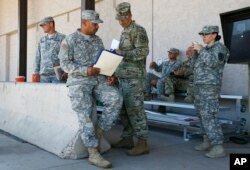 Arizona National Guard soldiers receive their reporting paperwork prior to deployment to the Mexico border at the Papago Park Military Reservation in Phoenix, April 9, 2018. U.S. Defense Secretary Jim Mattis signed an order last week authorizing up to 4,000 National Guard troops to secure the border. The order provided Pentagon funding for the troops through September. Mattis' directive also specified that Guard troops cannot participate in law enforcement and could be armed only when necessary for self-defense. A Defense Department memo said Guard members will not "interact with migrants or other persons detained" without Mattis' approval. President Donald Trump has said that he wants the military to remain at the border until a wall is built. But in its recently passed budget, Congress approved funding for only a limited section of new wall and some repair work. The National Guard are 435,000 reserve soldiers who can be called up by either the federal government or the states. Every state has its own National Guard, as well as Puerto Rico and the District of Columbia. Governors often send their guardsmen to deal with natural disasters or with civil unrest, such as rioting. The U.S. Constitution authorizes the federal government to use the National Guard to "execute the laws of the Union, suppress insurrections and repel invasions." The number of people apprehended while trying to cross the U.S.-Mexico border declined last year, but has been creeping up in 2018. Last week, U.S. Customs and Border Patrol announced that more than 50,000 people were detained trying to cross in March. That is up from 16,500 in March of last year, but still not as high as apprehensions in March of 2013 and 2014. Border apprehensions remain well below the numbers when former presidents George W. Bush and Barack Obama deployed the Guard to the border in 2006 and 2010 respectively.